↑ "The Rock Mini-Bio - Wrestling". Bellaonline.com. Retrieved 2014-08-13. ↑ "The Rock « Wrestler-Datenbank « CAGEMATCH - The Internet Wrestling Database". Cagematch.de. Retrieved 2014-08-13. ↑ "The Greatest Professional Wrestlers of All Time". UGO. Retrieved May 20, 2011. ↑ "The Top 100 Pro Wrestlers of All time Reviewed in Wrestling Perspective". Wrestling Perspective. Retrieved November 14, 2011. ↑ "Best Sellers Plus". New York Times. Retrieved 28 August 2012. 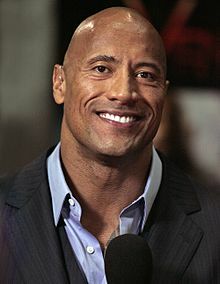 ↑ "Dwayne Johnson". Retrieved October 31, 2010.